Welcome to an article all about cannabis seeds. Learn the difference between the different kinds of seeds and how to check if they're any good. I'll try to write everything I can come up with about cannabis seeds. How to sprout and grow them will be in following articles. How is the seed made? To make a cannabis seed actually can be compared to making a human baby a lot. There needs to be pollen from a male flower on a male plant to fly to a female flower on a female plant. The pollen is completely like a fine yellow dust that easily travels with wind or attach to animals to get a ride. The female flowers are by far where the biggest amount of the potent medicinal trichomes are. A part of the female flower are the two white/yellow (later brown/red) pistils... small about 1cm. long fluffy hairs. When a pollen lands on one of these the production of the seed begins inside the female flower and will be fully ripe after 1-2 months. The seed should be cured for another month or two to have optimal sprouting. There can be thousands of seeds on a fully pollinated plant. The bud have a much lower medicinal quality than the unseeded flowers. But they're still fine and should not just be discarded after separation from seeds. The seeds have no medicinal value in the form of cannabinoids. But they contain other good stuff that is healthy to eat. Why are cannabis seeds often expensive? Making great cannabis seeds is not quite as simple as it sounds. If you are BREEDING seeds and not just PRODUCING seeds, it takes a lot of plants to do the work... the more the better actually. The breeder needs a good amount of plants to make sure the parents of the next generations has the best traits and behaviour. They have to look and smell like the strain is described, and it should be potent with the wanted cannabinoids in the strain (Most often THC, but today a lot of breeding with CBD-strains is going on). If done right the strain should be improved with generations in the hands of a breeder. Growers often make a big mistake in the breeding process... More than often the parents can be quite random... Maybe the best of 3 mother plants and 1 father plant... sometimes there is only 1 of each making it impossible to compare to a sister and a brother from the same strain that could have even better qualities. There should be lots of sisters and brothers to determine which is the most awesome. By all means - everybody should experiment with making seeds, and it works just great - no problems with it at all. Just that in some generations the strain might not be quite what it was from the original breeder. It could be and sometimes is, but often it will have lost a little bit of the x-factor... This is also the reason why the same strain from two different breeders are often not completely the same... they are often two completely different lines where parents have been picked with different eyes often for many generations. So even if two breeders start up with seeds from the exact same bag of seeds they end up very different. So when you hear somebody talk about a strain name, and you want to try the same fire strain - make sure to get them from the same place. It's impossible to know if the plants that will grow up from a seed are awesome. But you can tell if the seeds look healthy and ripe. Good ripe seeds are mostly darker colors. When you see white or greenish colors on seeds, there's a good chance they are not ripe. See if it crushes easily between two fingers - if it does it's certainly not ripe. There are strains that are not quite as dark brown as usual, but often they're immature and will not have many sprouting if any. But if they're what you have give them a go... sometimes you'll see a seed that was ahead of the others. Some people claim to be able to see if a seed if a female or male seed... I don't believe that it works that way, but would just LOVE to be corrected and PROVED wrong. In the seedbanks there are some different categories that sometimes confuses some people. It's really pretty easy if you read below. There are 3 different main cultivars... or kinds of cannabis. C. sativa, C. indica and the C. ruderalis. Sativas are concidered to have more of an uplifting high, where the indicas seem to be concidered to be more of a body stoned effect. Most seeds today are hybrids - crosses between these and they are leaning more or less towards either. The last one - the C. ruderalis is the kind that will autoflower and is now hybridised with the other two to make the autos. There are two main categories/types of cannabis seeds (strains) - the Photosensitive and the Autos/Automatics. Photosensitive seeds (strains) will be dependant of daylengths to initiate the flowering. These are the "normal" kinds that flowers in the fall when the nights get longer. Within this category there is difference in how early the strain will initiate the flowering (how many hours of darknes) And how fast they will finish once the flowering is initiated. One of the earliest I have seen is the Danish heirloom Pibeurt. It initiates flowering and finishes super early. Many indica and indica leaning hybrids will flower faster than the more sativa leaning strains.. But sativas get less dense buds making them less prone to mold and handle the later finish date. Late flowering and mold as a result is one of the biggest problems to cannabis growers growing in colder climates. Slow and normal flowering strains often need help by putting them in darknes for some days to help them trigger flowering. Growing indoor this flowering is taken care of easily with a timer on the light. A photosensitive plant will keep growing vegetatively without making flowers as long as kept under light 18-24 hours. When switching to 12 hours of night the plants will start flowering. Photosensitive plants can be cloned and kept as an invididual in vegetative stage for decades. The can be clones/copied indefinite year after year. Autos are a newer player in the cannabis industry. They probably started appearing in the late 80... maybe earlier. Anyways they first really got known after the internet appeare in mid/late 90's. One of the first strains was called "Lowryder" and is still around in a more potent #2 version. Today there are thousands of auto strains. 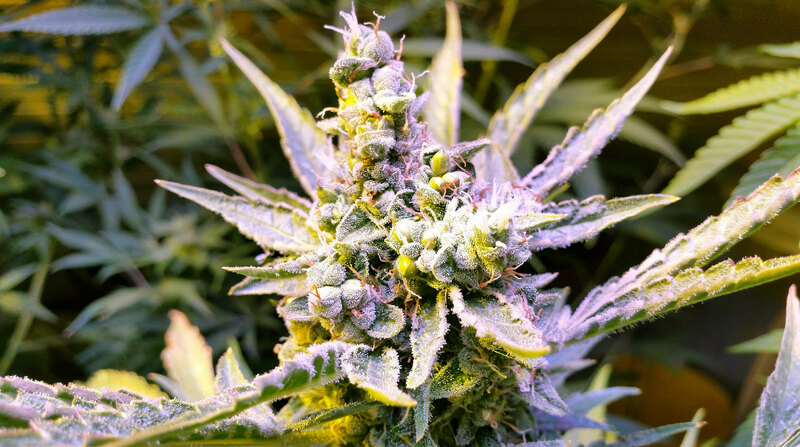 They are made by crossing normal photosensitive strains with autos with generations of carefully picking phenos showing autoflowering properties until it's a stable strain where all the offspring of the seeds will flower automatically. In the early days of the automatics they were hated by many growers for their lack of potency and yield. Today the potency problem with the autos is certainly fixed in modern strains. Most autos will grow much smaller than photosensitives because of much shorter time of growing vegetatively before initiating flowering mode. Some of the smallest strain can be as small as 25cm (around 10 inch) while some of the biggest so called "Super Autos" can go up to 2 meters (around 6 feet). Autos are awesome if you have limited space and want to grow a couple of plants in pots on a balcony. But you can also get a decent yield from them by just planting some more of them. Autos cannot be cloned - they can, but the clone will be the same age/stage as the mother and will certainly finish flowering in a very poor condition compared to a similar plant that is not a clone. Both the photosensitive and the auto strains come in regular versions and feminised version. Regular seeds have both female and male plants. Female plants are what is wanted for medicinal effects - males are mostly only used to make seeds. A male plant can pollinate a LOT of female cannabis plants making them focus more on producing seeds than producing buds with potent medicinal effects.. So seeded buds are not as awesome for medicine and recreational use as the unpollinated female flower buds hungering for pollen - the "sensimilla". So today we can buy many strains in feminised versions. All the seeds here will all be female plants. Off course a single pollen can have pollinated a single flower and made a single seed that is not feminised, but almost 100% of the feminised seeds will be female due to a process made in the breeding where a female plant is stressed into producing male flowers with pollen. A survival strategy most if not all strains hold. It's not true hermaphroditism. (Hermaphroditism is when a female plant produces male flowers without stressing it... this trait is very unvanted by most growers). What seeds are best for beginners? If you would like to make some seeds so you can grow them again next year, you need the regulars. You CAN make feminised seeds on the feminised strains, but that's a little more advanced and I will cover that in another article about breeding. You can pretty easily recognize male plants before any problems and isolate/remove them. If you don't remove, you are making many seeds and less awesome bud with much less smell, taste and potency. If you don't care for males, pollen and seeds - then you could buy feminised seeds. Some people recommend autos for beginners - feminised autos if you want to make it real simple and don't want males at all. The autos do have the drawback that they are not always very forgiving. They in most cases initiate flowering as soon as they are mature enough after just a few weeks of vegging. If the plant is not happy here and grow fast, it will still initiate the flowering on time - just as a much smaller plant. But as long as you are carefull a modern auto flower can certainly be a good option for a beginner - also maybe especially in the colder climates, where you can here schedule the harvest by the number of days the auto will be from seed to ripe flower - it's written on the strains and usually takes 2-3 months - sometimes longer. Planting around 1. of May in colder areas in Northern hermisphere is usually just perfect for optimal growth. But they can be started much later with great success. The photosensitive plants are more forgiving but also are sensitive to lights. So if you live a place with streetlights, cars passing often ... lights. Then this can tease the flowering of these photoSENSITIVE plants. In the early spring this can trigger an initation of flowering in the beginning of the season due to the long nights. So if you start the seeds up indoor very early, you often can make the day longer by just adding some more light in the evening... doen't need to be growlights - it's just for keeping them from flowering. When the days are longer, you can quit the extra light and just keeping them protected from frost. But the photos will not initiate flowering automatically so if the plants are not SUPER happy in the early days, the plant will catch up later in most cases. Off course it will grow bigger if super happy all the way. It's very easy to make seeds, if you have a regular strains. As explained earlier in the article, you want to use as many plants of your strain as you can to find the most beautiful parents that are also potent. That means that all plants/individuals should have a number so that you can separate them from each other if one turns out to be awesome medicine and the other that looks completely the same is not as potent. Sure you can just pick a random male and female and put some pollen on the white hairs (pistils) on a female plant. about 5-6 weeks later you should have mature seeds. Remember that you can isolate and pollinate a branch of the female plant. In that way you can get lots of seeds and still harvest nice sensemilla buds without seeds for medicine and recreation. Don't leave a brother hangin'! If you are making seeds and am using a male plant. Please think about your neighbour grower and don't just leave a whole male plant pollinate every single plant in town. You can cut a branch of a flowering male before he opens the flowers and spreads the pollen. Keep the cut in a glass of water indoor - when flowers open and pollen is falling from them pick it up in a plastic bag. Put the bag around a branch of the flowering female and shake it a little. Shake the excess pollen of into the bag. Of course you'll find an occasional seed in the rest of the plant - unless you are extremely carefull. But a few seeds in a plant won't affect the quality of these buds. Thanks for reading this far. Please feel free to follow our facebook page to join our next giveaway. Or check out our quality seeds. Thanks Mike! Its's all new to me and this helped me a lot! Thanks Brian. It's nice to hear that somebody likes it.